Since I’m seeking to write more regular posts, I thought a weekly or monthly “On my bookshelf” would give me something to work with (and something for you to look forward to). You’ll notice that I always have one fiction book, which I usually read just before bedtime and/or at the beach or stolen precious minutes of naptime. 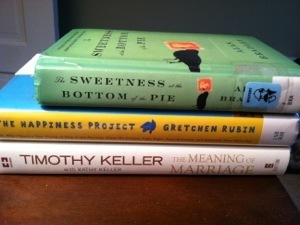 Right now I’m reading The Sweetness at the Bottom of the Pie by Alan Bradley. It’s a murder mystery, a favorite genre of mine ever since Nancy Drew, and so far so good. A little hard to get into the story, but I love the writing. In many ways, the happiness of having children falls into the kind of happiness that could be called fog happiness. Fog is elusive. Fog surrounds you and transforms the atmosphere, but when you try to examine it, it vanishes. Fog happiness is the kind of happiness you get from activities that, closely examined, don’t really seem to bring much happiness at all — yet somehow they do. … the experience of having children gives me tremendous fog happiness. It surrounds me, I see it everywhere, despite the fact that when I zoom in on any particular moment, it can be hard to identify. To be loved but not known is comforting but superficial. To be known and not loved is our greatest fear. But to be fully known and truly loved is, well, a lot like being loved by God. It is what we need more than anything. It liberates us from pretense, humbles us out of our self-righteousness, and fortifies us for any difficulty life throws at us.